Martin Fallaway is dying. With no family to whom he can leave his surplus fortune, he holds a contest on his tropical island, where ten families compete to be the last team left in order to claim the prize of thirty million dollars. Arriving on the island, the contestants’ need for shelter is paramount, but the warm, sunny days, powder-white sand and crystal clear waters cloak their perspectives. When a storm hits, causing the first departure, the remaining contestants realize their time on the island might not be as idyllic as they first thought. As the days tick slowly by, hidden dangers begin to manifest themselves; insecurities creep in, personalities change, inquisitive minds take over and secrets become lies. Reckless decisions made change their lives forever and when the unthinkable happens and their very existence is threatened, the island becomes their darkest nightmare. With time running out and the remaining contestants’ trust in one another challenged, can they bury their consciences and risk everything, or will the emotional sacrifice be too great? Like survivors of a shipwreck, ten hugely disparate families are conveyed to an idyllic deserted island somewhere in the Pacific Ocean. All they have to do is build a shelter and survive for three months. At the end of that time, the families that are still on the island will have a chance to win $30,000,000. To help them survive, each family has some supplies provided by the contest organiser and some more supplies that they have chosen themselves. As well, the island has plenty of fresh water, an abandoned orchard providing exotic fruit, and chemically designed green bins. The contest is the idea of Martin Fallaway. Although he is dying of cancer, his love of adventure and mischief prevents him from simply donating his fortune to the needy. Instead he has pitted these families, chosen at random, against nature and each other. Once conveyed to the island, the dangers of the tropics emerge along with the nastier side of human nature. In The Contest Carne Maxwell’s families interact with each other, figuring out who to like and trust and who to avoid. Inevitably there is deceit, spitefulness and kindness; mistrust, bigotry and romance. Maxwell uses a range of unfortunate events and misadventures to gradually reduce the number of competing families, but right down to the last pages there is no real clue of how the contest is going to end. Maxwell keeps up the pace, alternating tragedy with moments when the teams come together and forget they are competing, or when the adults and teenagers muse on their feelings and their family dynamics. 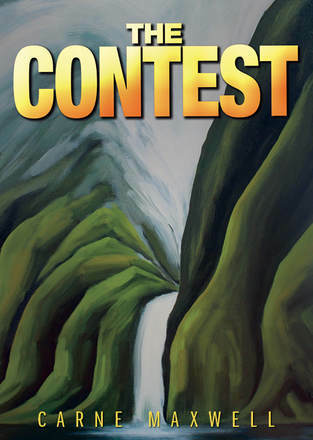 The Contest is a well-written, easy but suspenseful read. As well, it is a showcase for Carne Maxwell’s many talents. Not only is she the book’s author: she painted the cover illustration (a slightly sinister abstract scene that is a warning that while the setting may be very beautiful, there is something menacing lurking in paradise) and designed the book’s layout and cover, and did the typesetting. Carolyn McKenzie is a freelance proofreader, copy editor, and Italian-English translator. She also offers holiday accommodation for writers and others in Thames, New Zealand and Ventimiglia Alta, Italy. This review was first published in FlaxFlower reviews, which focuses on in-depth reviews of New Zealand books of all kinds, and is reprinted here with the kind permission of Bronywn Elsmore and Carolyn McKenzie.